It is made from hominy, with pork (or other meat), chili pepper, and other seasonings and garnish, such as cabbage, lettuce,oregano, cilantro, radish, avocado, lime juice, etc. 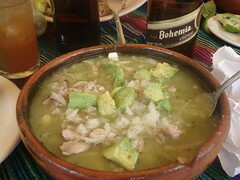 There are a number of variations on pozole, including blanco (white or clear), verde (green), rojo (red),de frijol (with beans), and elopozole (sweet corn, squash, and chicken or pork meat). I've made both verde and rojo versions of pozole, and hadn't heard of either de frijol or elopozole until I just looked it up. As I don't think I'm particularly ready to embark out into uncharted territory, I'm going to stick to what I (barely)know. Rojo and verde are polar opposites as you might expect... while you stew the pork in a fairly identical fashion in both, the former is tomatoes and dried chili based while the latter is all about tomatillos, cilantro, and fresh peppers. Rojo has the potential for deeper flavors and more complexity, I think... but it's Spring (even if it doesn't feel like it here in Boston) so I'm sort of drawn towards the verde. What may ultimately decide it is whether tomatillos are available at my local Shaws, since last time I checked, Whole Foods didn't mess with bone in picnic pork shoulders.